EdgePlayer Trading specializes in teaching Market Profile trading and in developing Volume/TPO profile indicators . For a quick overview of Market Profile, see the Introduction to Market Profile . For more in-depth information check out the references and sites listed on the Resources page. If you are interested in one-on-one training, see our Trader Training page. Our training, which is a quick and economical way to ramp-up on Market Profile, will teach you how to trade using only Market Profile analysis. While other indicators and services can be helpful, all you really need to trade profitably (and simply) is Market Profile. 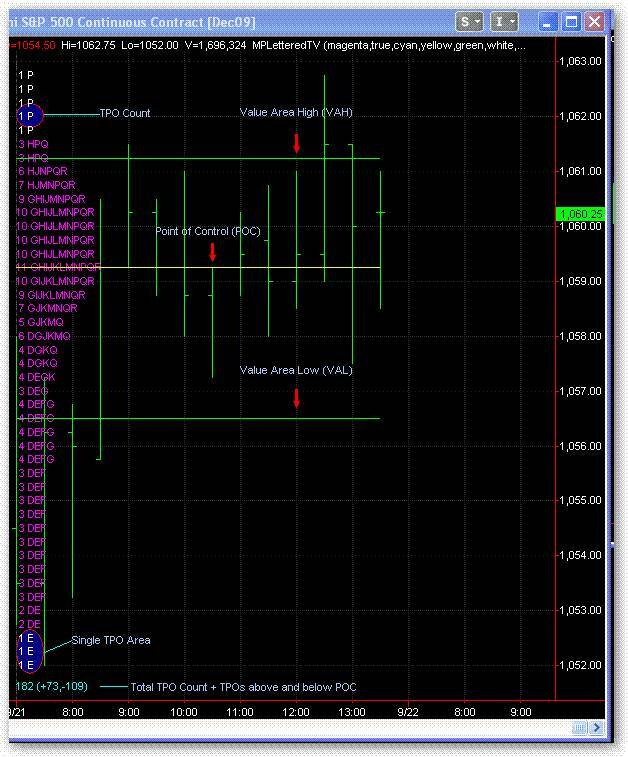 If you are looking for Volume/TPO profile indicators, check out the TradeStation Indicators page. Our high-performance indicators feature dynamic memory allocation (so you don't have to) and time-critical code written in C++ (much faster than EasyLanguage or C#) and are suitable for use with futures, stocks and FX. Depending on your computer, profiles can be run on 5-minute and lower charts as well as the traditional 30-minute charts. All are available free two-week trials. See the Examples page, which shows the indicators being used in a variety of markets and situations. Finally, if you are not finding what you looking for, consider having custom software developed for you. See the Custom Programming page for more information. Market Profile analysis is about identifying and trading with the most powerful forces in the market. The most powerful forces in any market are those that are the most common. Just as the daily ebb and flow of the tides and currents are the most powerful forces in the oceans (and not hurricanes), the most powerful forces in markets are the tendency of prices to either consolidate or trend, the tendency of prices to revert back to the mean and the tendency of prices to rotate or move in cycles. While the trades of big institutions, the effects of news and the influence of other markets can cause big short term moves, these moves are anomalies and once over price behavior returns to the aforementioned tendencies. These tendencies occur in all markets in all time frames. S&P Emini example, EURUSD Forex example, Crude Oil example. What Market Profile does is use the power of statistics to tell us when price has probably reached the high or low of a consolidation and is about to revert back to the mean. It does this by treating consolidations as so called “normal” distributions and applying probability measurements to the distribution. The familiar bell-shaped curve is a normal distribution. Note: author, professor, trader, Nicholas Taleb has pretty much debunked the idea that financial market prices are a normal distribution in the long term. However, in the short term, consolidations of price do appear to act like normal distributions. The traditional market profile display is a graph with price on one axis and time on the other axis. It is appears turned on its side because the typical financial markets chart uses the vertical axis for price. Data points are represented by letters of the alphabet, which identify the 30-minute period(s) in which a price has been traded. For example, if the letter K is assigned to the period 12:00 – 12:30 CST then a “K” is drawn next to any price that trades during the K “bracket”. The letters are also known as time-price opportunities (TPOs) and lettered charts are often referred to as TPO charts. By the end of the day every price that has traded will have a line of one or more letters next to it. When viewed together, these lines of letters, which are like histogram bars, resemble a bell-shaped curve. The prices with the most TPOs are in the center of the curve while those with the fewest TPOs are at the ends of the curve. The price with the most TPOs is known as the point-of-control (POC) and the area of the profile (fanning out from both sides of the POC) that contains 70% of the TPOs (roughly one standard deviation) is known as the value area (VA). The high point of the VA is known as the value area high (VAH) and the low point of the value area is known as the value area low (VAL). The POC, VAH and VAL are the most watched values produced by the profile and are very often the entry/exit points for trades. The other important piece of information conveyed by the traditional profile is the number of TPOs above and below the POC, which can indicate whether sellers or buyers are in control. This is an example of a traditional Market Profile display: Traditional MP example. Notice how the value area encapsulates the consolidation of price. Traditional lettered profiles were developed before computers were widely used to display charts and when markets only traded six to eight hours a day. However, with the widespread adoption of computers as the preferred method of displaying charts and with the advent of 24-hour trading, the use of letters to represent TPOs has become problematic. In particular, lettered profiles do not scale well, which creates problems when it is desirable to see profiles from wide ranging days, profiles from multiple days together or long range profiles (in which letters have no meaning). Histogram profiles are an attractive alternative in these cases. Because they are pixel based rather than character based, they scale quite well while conveying the same information. Histogram MP example. A variation of the histogram profile is one that uses plots instead of horizontal bars to identify the DVAH, DPOC and DVAL. Plots, in addition to showing the current DVAH, DPOC and DVAL, also show the progression of these values throughout the day. Plotted MP Example. Another variation of the histogram profile is the volume profile. Instead of constructing histogram bars based on the prices hit during each time period, the volume profile constructs histogram bars base on the volume of trade at each price. Although TPO and volume POCs are usually close to each other, a valuable benefit of volume profiles is that it is not constrained to the official 30 minute time-frame of TPO profiles. The POC of a volume profile is always the price with the most volume, regardless of time-frame. Volume Profile Example. 2. Market Profile Analysis can be quickly applied to new markets without modification (simply change your chart symbol). 3. Market Profile Analysis uses market generated information that is not derived and has no lag. 4. Market Profile Analysis can be combined with virtually any indicator or strategy to improve performance. Value Area (VA) - At the end of the day, the price area encompassed by 70% of the trades that have occurred or approximately one standard deviation above and below the Point Of Control . Value Area High (VAH) - At the end of the day, the top of the Value Area. Point Of Control (POC) - At the end of the day, it is the area where price has spent most of its time. The POC will also be the longest line of time-price opportunities (TPOs) in the profile and is usually near its center. Value Area Low (VAL) - At the end of the day, the bottom of the Value Area. Developing Value Area (DVA) - The price area encompassed by 70% of the trades that have occurred so far during the current trading day or approximately one standard deviation above and below the Developing Point Of Control. Developing Value Area High (DVAH) - At any point during the day, the top of the Developing Value Area. Developing Value Area Low (DVAL) - At any point during the day, the bottom of the Developing Value Area. Time Price Opportunities (TPO) - A price that has occurred in a given 30 minute segment or bracket of the trading day. Each 30 minute segment is a assigned a letter. For example, if a price occurs in the 9:30 - 10:00 EST segment it is assigned a "D", if the price occurs in the 10:00 - 10:30 segment it is assigned an "E". Most traditional Market Profile indicators will build up a profile of TPOs. At the end of the day this profile will look like a bell -shaped curve that has been turned on its side. Single TPO Area - An area in the profile that is only a single TPO wide. 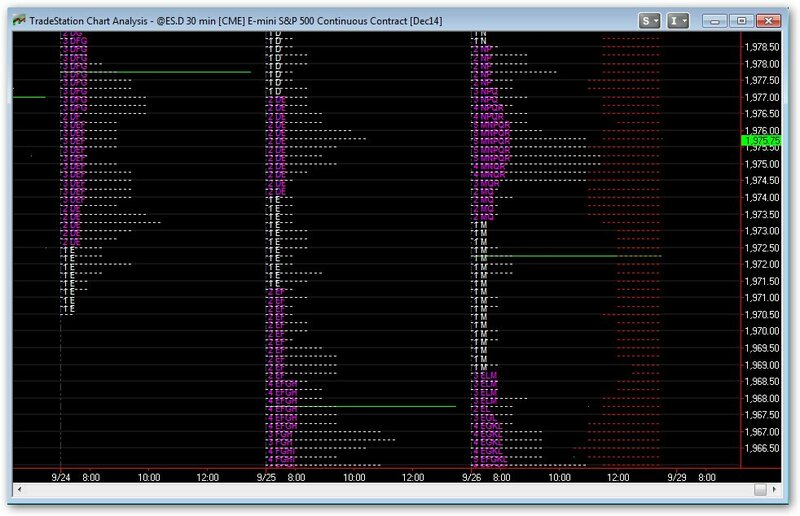 Single TPO areas usually indicate the presence of large traders. The most important Singles are the ones that have multiple TPOs areas above and below. Initial Balance (IB) - The the price range of the first hour of trading. Naked POC (NPOC) - A previous day's POC that has not yet been touched by price. Volume Profile - Market Profile based on volume at price rather than time at price. Volume profiles are usually depticted using histograms. Volume POC (VPOC) -- The price where the greatest amount of trading volume has occurred. It is different than the TPO based POC but is usually close to it. However, since it is not constrained by time it can move more quickly. High Volume Node (HVN) - Same as the VPOC. Low Volume Node (LVN) - The price or price area where the least amount of trading volume has occurred. Usually, LVNs line up with Single TPO areas. Learn more about Market Profile by taking the Trader Training or try out the TradeStation Indicators. Financial markets trading involves substantial risks. It is also possible to lose more than your original investment when trading futures and options. In no case should the content of this website or its communications be construed as a guarantee of profit or limit of loss. EdgePlayerTrading develops trading software and teaches trading. It is not a registered investment or trading adviser; all trade recommendations and methodologies are for educational purposes only. Any trades you take are strictly at your own risk.